A three bedroom semi detached family home situated in a cul de sac in the popular village of Gawcott, in catchment for the local schools including the Royal Latin Grammar School. The property benefits from a re fitted kitchen, conservatory, Upvc double glazing and front and rear gardens. Accommodation comprises: Entrance hall with built in storage, cloakroom, refitted kitchen with sliding doors leading to a conservatory, sitting room, inner hallway, first floor landing with built in storage, three bedrooms and family bathroom. To the outside; Storage room located to the side of the property and front & rear gardens. EPC Rating E.
Storage cupboard, solid wood flooring. 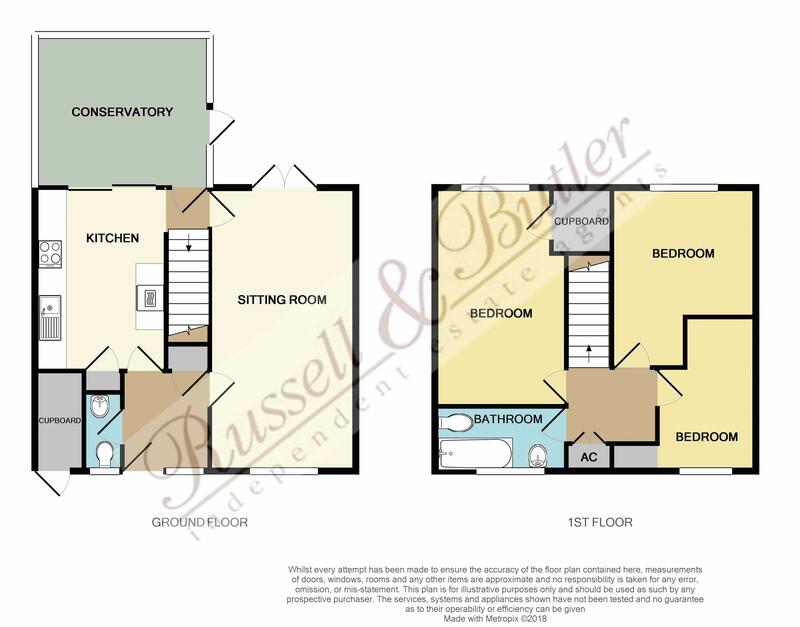 Low level w/c, wash hand basin, laminate flooring, Upvc double glazed window to front aspect. A range of base and eye level units, stainless steel sink unit with a mono bloc mixer tap, cupboard under, work tops over, tiling to splash areas, integrated double oven, integrated hob, space and plumbing for automatic washing machine space for tumble dryer, integrated dishwasher, space for fridge/freezer, storage heater, solid wood flooring, storage cupboard, sliding door to conservatory. Upvc double glazed and brick built, tiled floor, electric connected. Solid wood flooring, two storage heaters, Upvc double glazed window to front aspect, Upvc double glazed French doors to rear. Stairs rising to first floor, door to conservatory. Access to loft space, cupboard housing hot water tank with linen shelving as fitted. Upvc double glazed window to rear aspect, storage heater, storage cupboard. Upvc double glazed window to rear aspect, storage heater. Upvc double glazed window to front aspect, built in storage. Fully tiled bathroom, white suite of bath with 'Triton' shower over, pedestal wash hand basin, low level w/c, Upvc double glazed window to front aspect. Laid mainly to lawn, door to storage cupboard. Laid mainly to lawn with a range of flower and shrub beds, paved patio area, storage shed, gated side access.